Both of these cars are obviously summertime specialties, but their attraction for derivers of all ages and sizes remains steadfast. And a little harsh winter weather shouldn’t be able to stop that. The biggest winter challenge for the MX-5, which 95 percent of the world’s drivers continue to call the Miata, by my humble estimation, has several enhancements for 2019, including a power-boost to the engine, which is now a 2.0-liter with nearly 20 percent more horsepower, at 181, and 151 foot-pounds of torque. That makes a big difference in a light and agile roadster, and the larger engine does allow you to put the car through more paces, quicker. 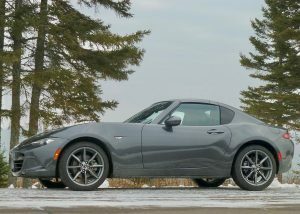 Rear-wheel drive is not the ideal recipe for winter driving, but the Miata’s hardtop makes a cozy interior. But the biggest story of the test car, which costs up in the middle-$30,000 range, is the roof. A lot of companies have tried hideaway-hardtops with varied success. Some look bulbous when the top is up, others not so much. But the roof on the Miata is a jewel, with strongly contoured lines and grooves that make it look like a fixed hardtop with a racey slope as it comes down to blend into the trunk. It works very well to insulate the driver and passenger from the cold, and the heater and other features work efficiently to keep you cozy and secure. 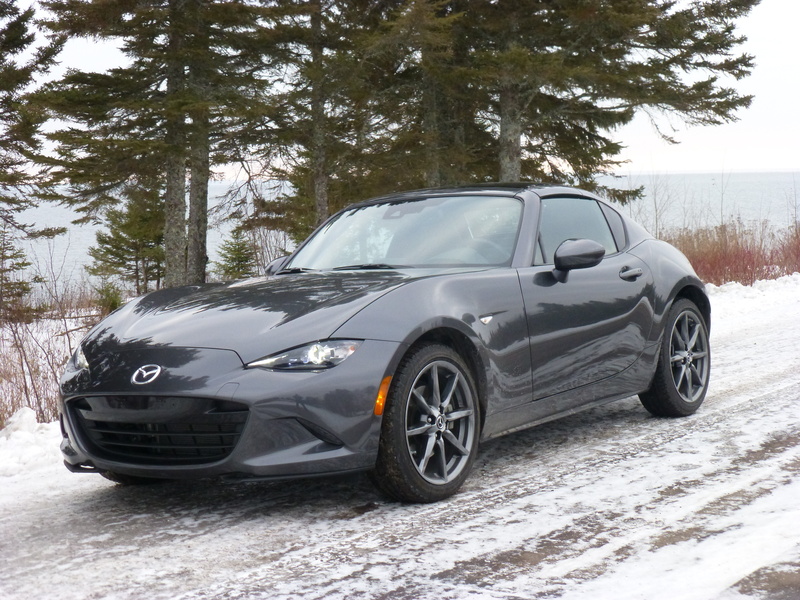 Of course, the uncompromising problem with driving a Miata in Minnesota wintertime is that its peppy little front-mounted engine sends its power to the rear — a method that old-time purists claim is the way a true performance car should be. I disagree, having proven many times that a well-engineered front-engine/front-wheel-drive car can handle as well as any rear-drive sports car, it just isn’t so insistent on spinning out. With rear drive, even with snow tires, the rears spin and try to overtake the powerless front end. 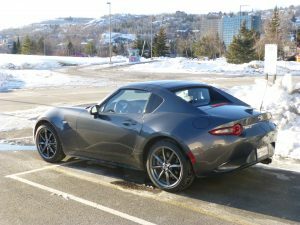 So if you want to drive a Miata in winter and prove how warm you can stay with the roof up and fixed in place, you’ll enjoy the warmth and security, but you’ll still want to be very careful if you encounter any ice or hills. Or, in Duluth, Minnesota — both. 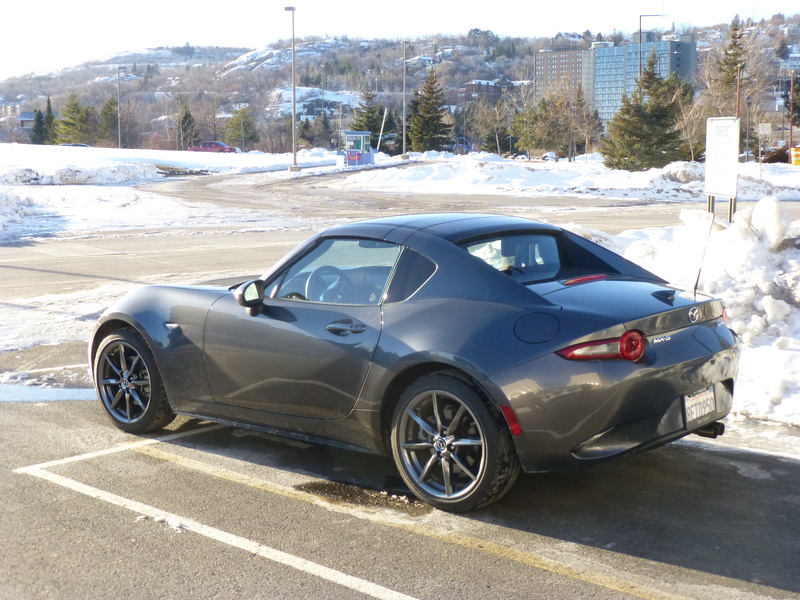 Owners usually park their Miatas for winter, but with the right tires, new hardtop works. A refined interior also is pleasant, and the test car came with a 6-speed stick shift, which helped it get around after a light snowstorm. I was late for an appointment, however, because our driveway is pretty level, and then tilts up just slightly over the last 50 feet to the main rural road passing our house. I tried slowly to creep up that final slope, but the ice under the snow caused me to spin. I tried again, backing up each time to get something of a run at it. All in all, it took about 15 minutes before I got it just right and made it onto the road. So the nice interior, the spunky engine, the crisp-shifting transmission and the razor-sharp handling, plus the hardtop, make the new Miata worth $35,000, but be very, very careful if you drive it on wintry roads. 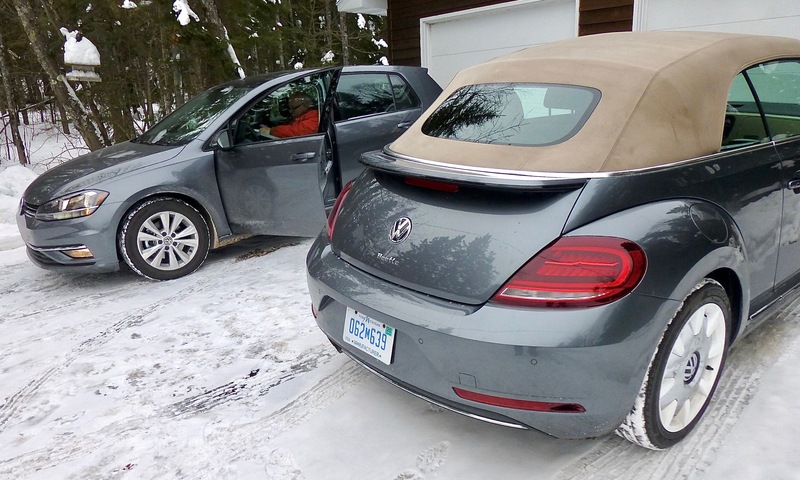 Tight fitting fabric top makes the Beetle Convertible more like its cousin, the Golf. My mother bought a new Beetle in 1960, and I learned a lot about driving in that car, among other things. In those days, of course, the Beetle was the nickname for the rounded little vehicle with its flat-opposed rear-mounted/rear-drive 4-cylinder engine. That car had great traction for hills, with the weight of the engine over the drive wheels, although in a few icy situations if you over-corrected you might get the rear end to swing around like a pendulum, and spinouts were both surprising and exciting. When Volkswagen brought back the Beetle in its most recent incarnations, it wisely modernized the car to essentially become a Golf with a Beetle body. The Golf has front-engine/front-wheel-drive, and is legendary as an all-weather performer with its various hot little engines. The cabriolet, or cabrio, is the convertible version, and the “ragtop” is extremely tight and precise fitting. You do hear a bit more road noise than in a full-roofed car, but you don’t feel particularly cold or uncomfortable because of the roof’s lack of solidness. The roofline of the Beetle Cabrio is particularly appealing, the way it slopes back and blends in perfectly. The test car, stubbornly trying to stay under $30,000, is worth buying if you ever liked Beeltes, just for the collectors who will one day be seeking them. If VW quits making them, or bringing them to the U.S., they will probably be more valuable than they are new. Sporty silhouette is further evidence ot well-designed cabrio top. Buried under a foot-deep snowstorm, I went out and popped the door open, climbed aboard, and hit the push-button starter, and even though it had been idle for two days, it fired up instantly. 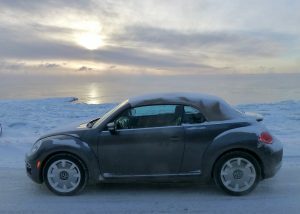 I drove it for a short dash just so i could line it up with the interesting background of the winter sky over Lake Superior, when the temperature was 15-below actual and wind-chill somewhere below that. A year ago, you could get the Beetle Turbo, which was basically a GTI in Beetle style. VW has tried other models, and now it is pretty basic, with a 2.0-liter turbo that has 174 horsepower and 184 foot-pounds of torque. 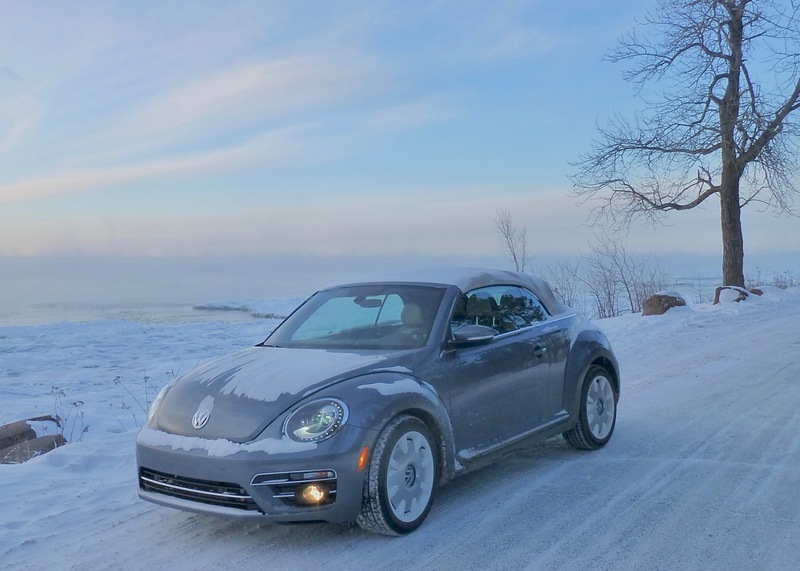 That puts the Beetle Cabrio in pretty swift company, and its suspension is sufficient to allow you to zip around curves and cloverleafs with ease, even if it isn’t an outright sporty car. The Beetle’s most recent style arched the roofline a bit farther back to provide more headroom in the rear, and that style remains, even with the Cabrio. I’m not sure how many adult friends you can coax to climb into the rear seats, especially when the temperature is bone-chilling cold. But wait until a nice June afternoon, when the sun is still high and the temperature is in the high 70s, and you drop the top and ask friends if they’d like to go for a ride, and you might need to accept bids. 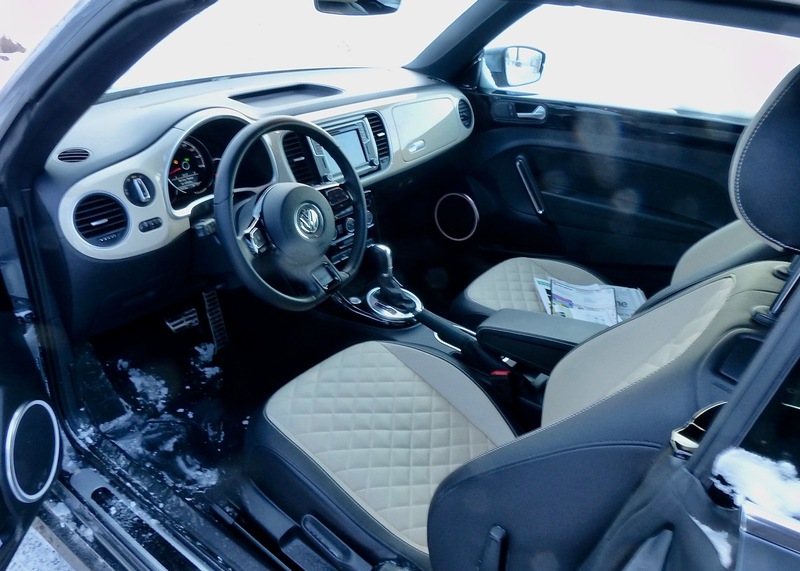 Well-appointed VW interior gives Beetle convertible a luxury attitude. The base Beetle starts at around $21,000, and you can add features to boost that price. Obviously,. going to the Cabrio boosts it highest, but the above-mentioned Miata is probably one of the few mainstream convertibles you can find, and that’s a 2-seater. 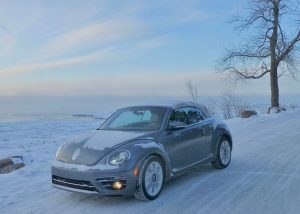 The seats in the Beetle are quilted and fit over well-contoured front buckets, which provide more support and comfort than any VW seat this side of a GTI that I can recall. The new Golf is impressive, and the new Beetle Cabrio is soon to become the “old” Beetle. So get one while you can, and be sure it will give you many miles of endurance and over-30-mpg economy. The beauty of driving these two cars in midwinter is that both of them are reminders that high snowbanks, slippery highways and sub-zero cold will not last forever.